95% of the energy needed by Morocco to plunder the phosphates of Western Sahara is delivered via SiemensGamesa windmills. The company has now prolonged its service contract for the controversial windmills for another 15 years, while continuing to refuse to comment on Saharawi consent. 22 windmills from SiemensGamesa are supplying 95 % of the energy needed by the Moroccan state phosphate company OCP to plunder the territory's non-renewable phosphate resources. The mills were delivered by Siemens in 2013, and the deal was followed with a five-year maintenance contract. That contract thus expired in 2018. On the occasion of the termination of the Siemens maintenance agreement, WSRW sent a letter to SiemensGamesa inquiring into what happened next. In a response from Siemens Gamesa to WSRW on 16 November 2018, the company clarifies that the contract has been prolonged for another 15 (!) years. The role of Siemens in Morocco's illegal depletion of occupied Western Sahara's mineral resources is covered in the 2016 WSRW report Powering the Plunder. SiemensGamesa's projects are carried out in partnership with a company belonging to the king of Morocco. WSRW also requested SiemensGamesa to clarify what it has done to seek the permission from the people of the territory. However, SiemensGamesa is still refusing to clarify that point. The CEO of SiemensGamesa Renewable Energy, Dr. Markus Tacke, wrote that the company "does not take a stance or make judgments on issues of international public law". "We doubt Siemens would argue that benefits to the local population is a good reason to invest in occupied Crimea. So why does it argue in such way in Western Sahara? We condemn SiemensGamesa for failing to respect the rights of the Saharawi people. SiemensGamesa's approach to the conflict, telling the world that the company knows better what the Saharawis want than the Saharawis themselves, is a deeply colonialist attitude, and goes directly against the principle of self-determination", says Sara Eyckmans of Western Sahara Resource Watch. In 2016, the Court of Justice of the EU concluded that the aspects of benefits are irrelevant to assessing the legal nature of business activities in Western Sahara. The judgment does not refer to the "population" at all. What is required is the consent of the people of the territory. SiemensGamesa also does not respond to the question as to whether it believes Western Sahara to be separate from Morocco. The company states that "the region of Western Sahara is disputed with the United Nations", even though the UN is in fact not considering it disputed or a region. The term "region" is a Moroccan term, while the UN labels it a "territory". Siemens' lack of knowledge relating to the territory being separate from Morocco is also visible on presentations after 2013. 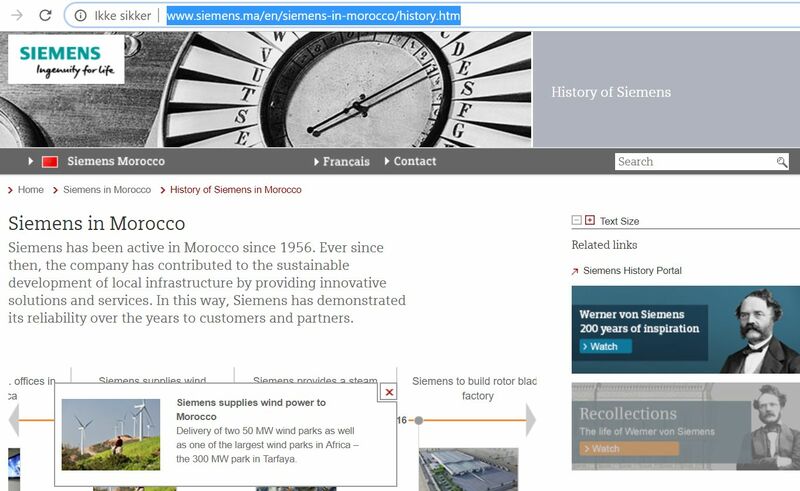 The website of Siemens still refers to the 50MW park as being in Morocco. Here is a presentation from 2015 and one from 2014. • Together with Enel Green Energy and Nareva, Siemens won the tender for the construction of the 300 MW Tiskrad wind farm and the 100 MW Boujdour farm. • Siemens is providing the parts for the construction of the 200 MW Aftissat wind farm. There is one other 5 MW wind farm that is privately owned by the CIMAR factory in El Aaiun. In addition, WSRW has found few references to plans of building another 400 MW wind farm near Boujdour - not a lot of information is available on those plans, and WSRW has not come across Siemens' name in connection to the project.